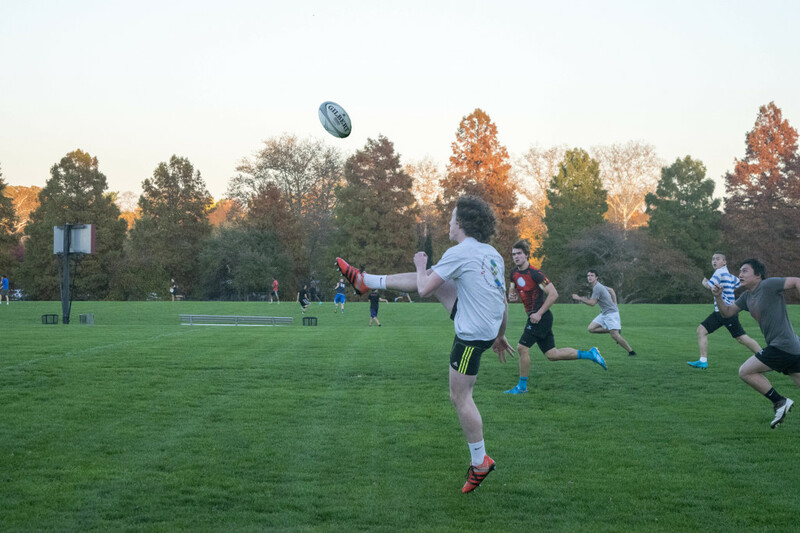 Back for their 31st season, the Swarthmore men’s rugby team is looking to revitalize a recently discouraged program. For the past three years, struggles have been plentiful for the club team. Lack of player commitment, manpower, and team standards all contributed to an overly lax atmosphere and repeatedly unsatisfactory records. Razi Shaban ’16, a four-year senior member of the team, expressed equally optimistic sentiments. “This is the best team I’ve seen in all the years I’ve played here,” he said. Such optimism is grounded in this year’s large influx of new and committed players. Two years ago, there were only a total of eight players on the team. Considering that seven players marks the minimum requirement needed to play, this left little room for injury and crippled the team’s ability to be truly competitive. This year, there are 21 members on the men’s club team and, despite vast inexperience among new members, their high levels of commitment to learning the game have already led to evident improvement. The team’s three-day-a-week practices have been crucial to the development of their many rookies, who have been learning basic fundamentals like passing, game control, and simply throwing the ball in order to play smartly and safely. Improvement has been swift, shown by how players have gone from not knowing how to throw a rugby ball to playing in matches after just a few weeks. An emphasis on the game’s fundamentals has been especially important given rugby’s notorious reputation for being a violent game. Prior to stepping foot on the field, new players are taught by their coach, Jordan Luchey ’12, and captains, Asplin and Luke Eppley ’17, how to play with proper form, take the ball into contact, tackle other players, and perform rugby-specific maneuvers like rucking and scrumming. Understanding form is paramount to preventing injuries, especially in a game that relies so heavily on physicality. “Rugby is a game where getting injured happens very easily, especially with inexperience,” said Rodolfo Perez ‘16. One of the most important maneuvers taught to new players is how to tackle properly. Rugby players tackle opponents shoulder-first rather than head-first, whereas football players, who are protected by pads and a helmet, can tackle head-first with less regard for their own bodies. Despite a heavy emphasis on safety, this year’s inexperienced team has fallen victim to rugby’s inevitable brutality, sustaining multiple concussions, sprains, and other game-related injuries. 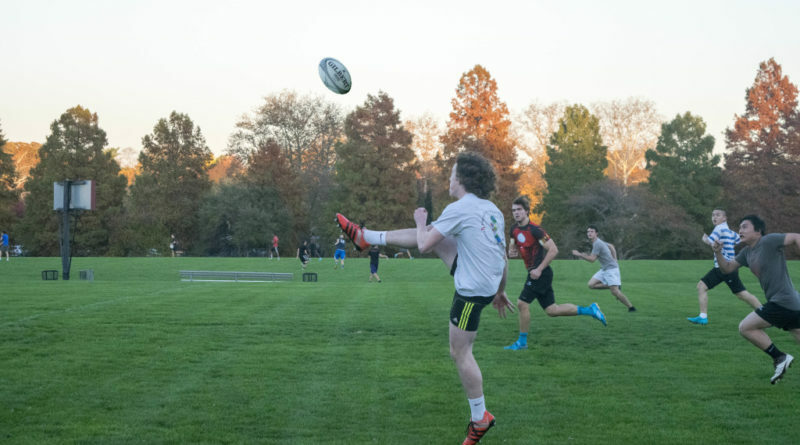 Every Saturday, Swarthmore players cleat up for one of five of the season’s round robin tournaments. For the first four weeks of the season, Swarthmore engages in division play, facing off against all three of the Small College South division’s other teams: Wesley, Washington, and Haverford College. In the fifth week, the top two teams from the North and South division advance to a final round robin tournament to compete for “The Cup,” while the bottom two teams from each division face off for “The Bowl.” Unfortunately, Swarthmore’s club, which has yet to win a match, is on pace to play for The Bowl. While the men have yet to reap the rewards of their efforts with a win, they maintain high spirits by enjoying the game and continuing to master it. When asked what he considered to be the most important element of the team, Shaban responded, “The reason most people come out here, to have fun. We’re not a dominant team in the league. We’re student-athletes, we really are, and when you spend all day in a box looking at a laptop it’s nice to spend a few hours a week going out and getting dirty, to tackle somebody and get hit.” Hopefully this passion for the game will continue to fuel improvement and translate into a successful future for the men’s team.